AnimatronicBear.com took one of their photo-realistic black bear costumes to Stockholm Sweden this winter to film an advert for the new eco-friendly SUV from Mitsubishi. Matt puppeteered his “Burtram suit” in the studio shoot for a wonderful host and production house there. 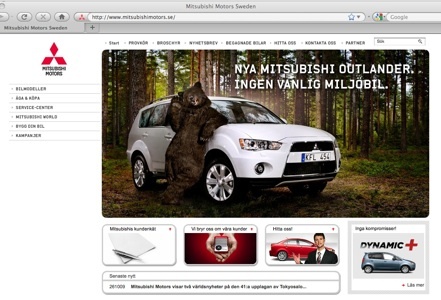 The ad is running on Swedish television and the company website for the entire country features our bear suit (see photo above).